Young scientists believe that solving a murder mystery, repairing a space ship or fleeing a science lab are what make natural sciences more exciting for pupils in the school environment. This is how a number of teachers are going to start teaching biology, chemistry and physics in Estonian schools in autumn. 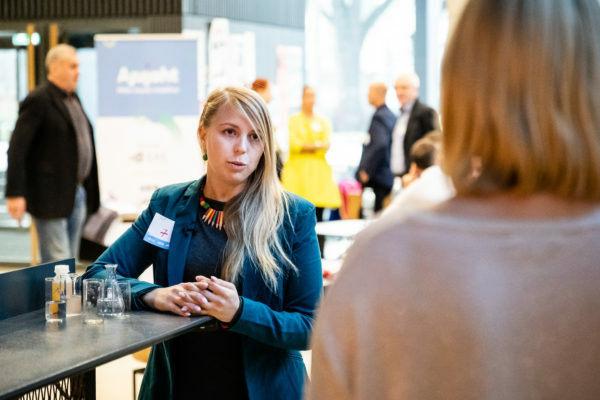 “We need Estonian youth to start looking more toward science,“ says the leader of the team EduScape, Tallinn English College natural sciences` teacher and Rakett 69 alumnus Luise Tiks,participating in this season`s development programme. With the inspiration and knowledge gained at a conference she attended in Brussels last year, she believes that the key to making natural sciences more engaging is gamification. This is what the scientists behind EduScape are attempting to accomplish. “Though PISA test results are improving each year and pupils are interested in natural sciences, they do not pursue further studies or a career in the area,“ Luise explains the problem and EduScape’s mission to promote natural sciences. EduScape is a game following the escape room format meant for subject lessons, which can be used to reinforce what has been taught in school with the teacher in tow. “EduScape provides the teacher with tools to carry out the games. The teacher`s role is to instruct, support and observe how pupils manage with using their knowledge to solve problems,“ Luise explains the game format. The escape game does not replace work in the classroom, but provides an additional tool to the teacher to solidify and check the pupils knowledge. The game set includes clue cards, tasks and necessary means to solve the tasks. For example, blood samples and reagents to determine blood group. Tiks got the idea to create the game in Brussels in autumn last year from an education conference, where the Israeli educationalist and researcher Ran Peleg spoke. “He spoke about how to design playful solutions for the school environment that help make the learning process more engaging for the pupils. The target group was teachers at general education schools,” said Luise. EduScape has been developing escape games from last autumn. “We have finalized the first experiments, which we conducted in Tallinn English College and Tallinn Secondary School of Science,” says Luise and adds that the teachers accepted the tests well. The team didn`t have specific expectations to the initial testing, but the feedback was unexpectedly positive. Based on feedback from the experiments, they are going to continue developing the games. At the moment, the team is focusing primarily on creating games meant for teaching natural sciences, as Luise and team member Kaarel consider themselves passionate science fanatics. The team members come up with the tasks and problems solved in escape rooms themselves. “We both have a background in natural sciences and I work as a teacher, so we know which topics are the most difficult,“ says Luise. More importantly, they see that the game solves an even bigger problem in Estonia. “We need more young people to continue their education in natural and exact sciences,“ says Luise regarding the team`s mission behind the games. In the future, the team sees the opportunity to expand the format to other subject as well, for example Estonian or English language. Currently, the games are under development and testing. All teachers and schools are welcome to let the team know of their interest on Facebook, the webpage www.eduscape.ee or through Hooandja . The games will be finished for the next school year.